ASTORIA, Ore. — It took me 47 years to get on a boat to go fishing for salmon on the Columbia River. It took me all of five minutes from the time the bait hit the water until I was reeling in said salmon. It took me a nanosecond to be hooked. Before Saturday, my idea of the Great Outdoors was searching the woods for my golf ball. As soon as I reeled in my first big catch — our guide said it was probably more than 20 pounds, less than 25 — I was ready to do that again. This season, though, there is a one-catch limit. For the rest of the morning on the river, I watched my five friends get their fish. We celebrated each catch. Victory dances. High-fives. Perhaps a shot or two. The first four catches came in the first two hours. That was followed by a long lull. “That’s fishing,” I was told, and there is a reason it is not called “catching” because there is no guarantee. Not that I minded. I already had that exhilarating moment of bringing one home. The rest of the morning was a combination of storytelling, making fun of the new guy (that’s me!) and hoping everyone on the boat would get to feel that same rush I had. During the lull, our group was already booking next year’s trip. Bryan Jones of Take Down Guide Service has been the go-to guide for my group of friends for years. I think he likes my friends because they don’t do stupid stuff on his boat. Of course, that opinion might have changed this year because they brought me on his boat. My experience with fishing was limited to a trip or two with some uncles and cousins way back in the day, but never for anything like a salmon. Pretty sure I was not even a teenager when I had my last fishing adventure before Saturday. Well, maybe one. Years ago, I brought my son to the Outdoor Show to fish in the pool at the Expo Center. I have never had anything against fishing or hunting. In fact, beyond my friends on this boat, I know several outdoors people and love hearing their stories. It is so much more than the hunt or the angling. It’s the love and respect they have for each other that is so appealing. Bottom line, though, I was never really taught any of this stuff growing up, so it never caught on with me. Still, I enjoyed hearing the stories from my friends through the years. They have invited me in the past, but it is always the same weekend. If you know me, I don’t like taking a day off during high school football practice in August. This year, I figured I could get away from football for a day, just to experience this fishing thing. To anglers, yes, I’m a rookie, and I don’t know much. But I’m not as dumb as I let on. After all, for 17 years I did sit next to one of Clark County’s most educated sportsmen in Allen Thomas, the former outdoors writer for The Columbian Newspaper. Just hearing his stories about Buoy 10 for all those years gave me some knowledge. The first person I contacted, in fact, once I confirmed I was going fishing, was Al. “Help! I’m going fishing!” I texted. He called right back, thinking someone hacked my phone. I’m into things like that. I love watching boats on a river. “No, Paul. There will be a thousand boats out there,” he said. Awesome. Even if I were not to even get a bite, I was about to participate in one crazy experience, with all those boats headed out to the river at approximately the same time. Al told me what I needed in terms of getting licensed for salmon. I went down to Sportsman’s Warehouse in Vancouver, and the ladies at the license desk were so helpful. One told me that I should get the season pass because it will be cheaper if I decide to go back out another day. In fact, she promised me that I would love it, and that I would, indeed, want to keep fishing beyond Saturday. I told her thanks, but I had gone 47 years without being on the Columbia River, so let’s just take it one day (pass) at a time. We stayed in a house in Long Beach the night before the fishing trip. Then someone woke me up at some ungodly hour and said it was time to go. Go where, I asked? Go back to sleep? Apparently, this is what fishermen and women do — they get up early. We arrived in Astoria just before 6 a.m. and then the fun part. Our guide pushed his boat to top speed. (I did not ask how fast because I did not want to know. When you are seated and the boat is slicing through the water and the wind is in your face, it feels like you are going 100 mph, and I loved it.) This is like a ride at Disneyland, I thought. Interestingly, our guide did all the work. To be fair, my friends know how to fish and love all of the time and set-up associated with fishing. But once a year, they like to pay for a guide service to do most of the heavy lifting, so the day is mostly just a get-together with friends while pulling in some fish from time to time. My friends could do this without a guide. They are experts. For a rookie like me, though, the guide is the most important person in the world. Jones showed me what to do, what depth to set my line, and reminded me that the lead ball will hurt if it swings out of the water and smacks me in the head. Anyway, we got out on the water, set out our lines and we were fishing. Five minutes later, I was trying to reel in one. Looking back on it, that was just so bizarre. This was not me. But it was me. I start reeling. The guide is giving me instructions. My friends are cheering me. The guide says he would love to help me a little bit more but, you see, the boat is moving and we are about to go under the Astoria Bridge, and, well, he’d prefer to not, you know, crash. I look up for a second. We’re under the bridge. I look down, and there seems to be a very large marine animal fighting to stay in the water, and I’m trying to get that thing close to the boat. I learned a couple things: That fish is strong. I am weak. But eventually, the net scooped up the fish and we claimed victory! Three of my friends caught fish soon after. Then that lull. Our group was having a blast, so it was not too troubling when the fish were not biting. So we stuck it out, hoping to get two more. Sure enough, one after the other. After that long lull, we got two within 10 minutes. He meant anybody, but he particularly enjoys seeing first-timers on the river. A year or so ago, he had a 92-year-old rookie on his boat. 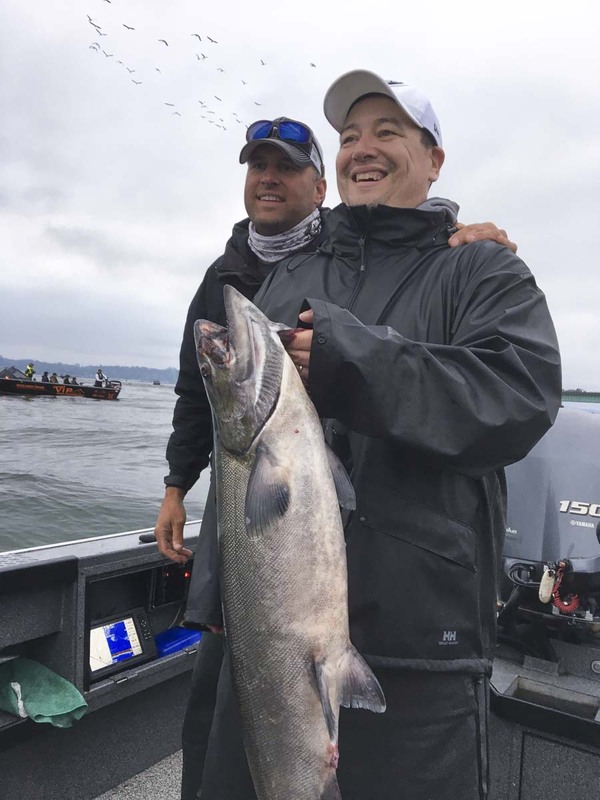 “It was a bucket list thing for him, and he filled that, and that was really neat,” said Jones, who lives in Sandy, Ore., but “lives” in Astoria for a few weeks every year to guide people through one of the best places to fish in the world — the Astoria and Buoy 10 fishery. While I acknowledge I don’t have anybody else to compare, Jones has to be the best guide in the world because he got me to catch a fish. After all was said and done Saturday, my fish was the largest in the group. Which, of course means, I am the fisherman of the year for my group, right? Right? We went back to Long Beach for more celebrating. I prefer driving home at wee hours, so I left the house at around 2 a.m. An hour into my drive back to Vancouver, it seemed like every vehicle going the other way was towing a boat. Now I know why they get up so early. Yes, I could give you some expert stuff about how the water is calm in the morning, how the fishing is better in the morning, but I know the real deal. This is so darn fun, nobody wants to waste a minute. As soon as the sun rises, you gotta be fishing. Seriously, you have to find yourself out on the river one day. You have to experience this. If you are a rookie, if you are intimidated, don’t be. Find some friends, pay for a guide, and go get yourself a fish story.